As recently as a decade ago, phone calls and face-to-face conversations were the dominant forms of communication in most of the business world. Heavy computer, internet, and email usage was only common in certain sectors and job functions. Fast forward to today, when the average worker sends and receives over 120 business emails per day and spends nearly 30 percent of the workweek managing email. When business email exchanges are combined with personal ones on a global scale, it amounts to 205 billion sent emails each day—a number that is expected to increase over 16 percent to 246 billion emails in 2019. As you may have guessed, this upward trend is a worrisome matter. Problems associated with email overload are well-documented and transcend from the office into the home. Among the key negative consequences are increased stress levels concurrent with decreased productivity, focus, brainpower, and employee morale. While some organizations have taken measures to cut down on internal email exchanges, studies suggest this is not what employees want. Moreover, such policies will fall short in combatting a continued and growing influx of externally generated emails. Is there a solution to inbox overload? Or are we just doomed to spend our lives consumed by email? Ever the solutions-oriented email optimists, we at SaneBox set out to create the infographic below. It paints a visual representation of the email landscape described above. More importantly, it offers a carefully practiced and refined solution to inbox management in the days of email overload. Welcome to email triage, an approach that will help you process thousands of messages in a fraction of the time. 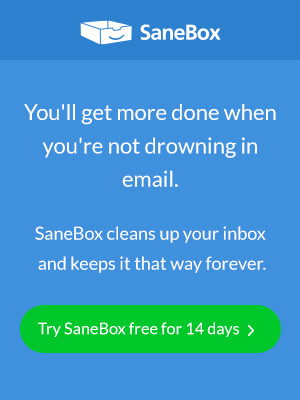 Next Entry There are so many ways to use SaneReminders—Here are our favorites! I am trusting you that Inbox zero IS a possibility for me! My best friend has always teased me about my never ending Inbox! It was fun but I still have way to many emails in my inbox.